Just Cause 3 and Assassin's Creed: Freedom Cry lead next month's lineup. Greetings PlayStation Nation and welcome to another PlayStation Plus Free Games Update. But first, have you tried That’s You! yet? All PlayStation Plus members can get this game as part of their membership. Set off on a journey of discovery with up to five of your friends and family, and find out what you really think about each other. Joining the fun is easy: just have your TV, PlayStation 4 and Android/iOS phone or tablet ready. That’s You! is the perfect summertime party game, so download it for free today before this exclusive download offer ends! Now, on to our other games this month. First up, we have the excellent and chaotic Just Cause 3. Take Rico Rodriguez on a truly wild ride to liberate Medici from military dictatorship. Your greatest weapon is your ingenuity. And explosions. Next we have Assassin’s Creed Freedom Cry, a standalone adventure set after the events of Black Flag. Guide Adewale on an emotional story, using his skills as an assassin and his deep convictions to free oppressed people. And those are your free games for August. But wait, there’s more for PS Plus members. PS Plus Summer Movies are here! 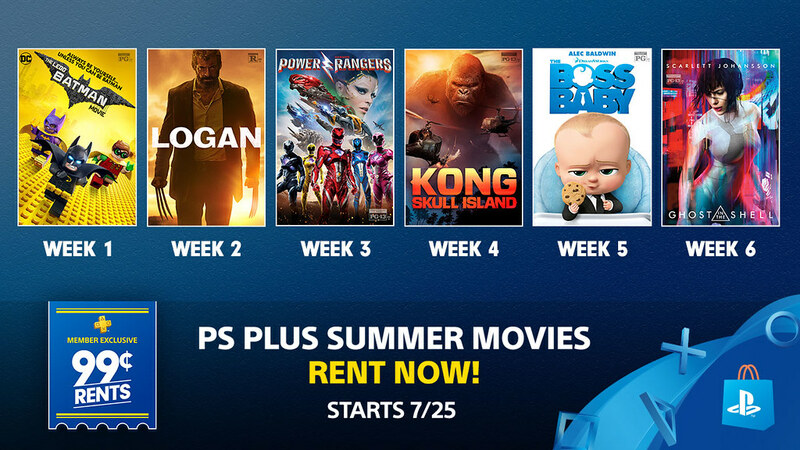 Enjoy six weeks of 99¢ rentals – selected for you from this summer’s hottest blockbusters. Starting us off with a bang, The Lego Batman Movie – handpicked for the whole family to enjoy. Check out the full schedule of movies below, then head over to PS Store each week to enjoy 99¢ rentals. You can download the PlayStation Video app on Android or iOS devices and watch your movies on the go. Once rented, your unwatched movies stay in My Videos for up to 30 days. Hot right? For Free-to-Play, Dreadnaught, launching in open beta on August 1st, will be offering a $20 PlayStation Plus pack starting August 15th. All PlayStation Plus members will also get the Ravenswood Plus Pack free. There’s lot of great stuff to look forward to, but if you want something immediate, this weekend only, PlayStation Plus members can play Doom for free starting tomorrow, Thursday the 27th until the 30th. Play all weekend long, then save 50% on the full game purchase in the PlayStation Store with a PlayStation Plus exclusive discount, which is available through August 3rd. And there you have it! See you next month. Another great lineup. PlayStation been killin it lately. 3 terrific PS4 games including a full, recent AAA, an awesome expansion, and an excellent indie. Just Cause 3 is as legit a freebie as u can get. When does this line up drop?? When does this lineup drop?? As much as I can appreciate ps giving away these great titles, this is an awful lineup for me. I already have jc3 and ac freedom cry. I’m paying £5.99 a month for games I already own! My point is there should be a system for people like me who already own upcoming ps plus games, maybe a refund to go and spend elsewhere in the store? Or at least decide and tell us months in advance what the games are so we know how long we have to wait for a game we want and don’t accidentally buy it the next day, not to mention that all of the websites that predict the games are totally wrong, didn’t get a single one of these. In reply to delftware in this post. You do realize that what you are suggesting makes absolutely no business sense whatsoever. You paid the price you paid for the game. You played the time you played. You enjoyed it or didn’t, and several months/years another person gets to play it for their monthly subscription. So your money to purchase the game bought you a perk that you cannot return, and that is the time you spent with the game ahead of everyone else. Which is why PS Plus offerings are best when they are indie titles that just released that day/month. Because then you are getting the most bang for your buck. Everyone wants the AAA titles for PS Plus, but that simply is not what it is for. If that is what you want… you are basically asking for free games. Which is just silly. Yea, delftware, if they announce months in advance people won’t buy the game and that hurts the company that makes the game. I’m not even sure how far in advance Sony locks in to these games. Sony has to pick games that have a good balance of how good the game is and how many people already have it. That’s why we don’t get as many AAA titles as we would like, even if Sony did it too many people would already have the games, so most AAA titles offer less value (to the entire community) than the more mediocre games. Last month I already had Until Dawn.. it’s just something that can’t be helped. This month it is you but every month there are so many people that already have the games. On the bright side you own both games regardless of your subscription. If we stop paying monthly we lose the games. What happened to latin america?? Why did they replace just cause with a cheaper game? We pay the same. 1. half your psplus game deals to me, none of those games worth getting. 2. half the games you have on regular price some can be found new and cheaper in many stores, others are found cheaper, and then games not of this year and your still selling them at regular price wtf, still cheaper at stores some even on amazon. Not my kind of games this month. To HellBringer1975: I don’t really have any standpoint on AC but I already disagree with you on that it will always be a very boring experience. JC3 is an AAA title. “Indie Garbage” should be thrown away, just like your grammer was when you were in grade school. Anyway, like I said, JC3 is a AAA title with a full $60 pricetag at release, so it can’t even be considered an indie title as the game is mainstream. You honestly make it seem like you don’t know the difference between . And explain how this game is outdated, as the game only came out a year ago? And don’t play that bs “CoD is irrelevant too” card as the game is still very popular aroud the world. Lol HellBringer1975, I game as much as anyone and haven’t played either title because AC has so many releases and Just Cause never grabbed my attention over all the more popular AAA games. A real gamer would know not playing any single game doesn’t disqualify you from being a real gamer. Sony looks at how many gamers own/played the games before they select. That’s why there aren’t many AAA titles, too many people have played them so not enough people would be rewarded. 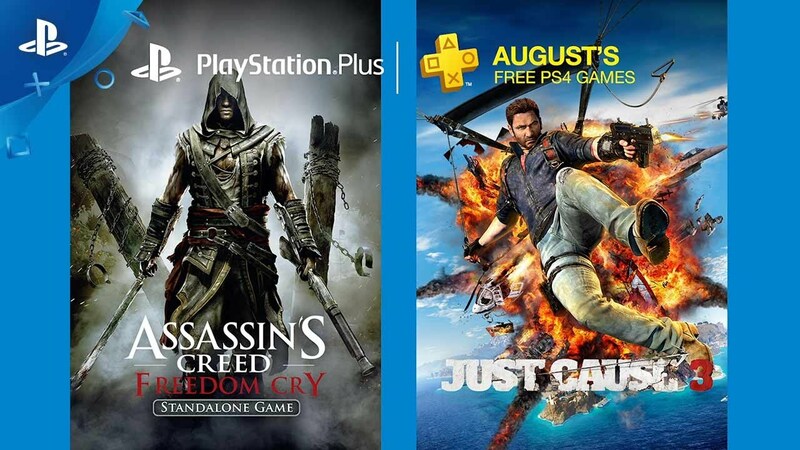 If Sony chose these games as the monthly freebies, sooo many people haven’t played them. This is arguably the best month PS4 has ever had. Nice to see PS4 is still getting AAA titles! Wow another great month! Keep it up and 2017 will be the best PS Plus year ever. I think it has been 2 years since I have been excited for a Plus freebie ! Holding off getting a cheap digital copy has paid off ! Life is Strange, LBP3, Transformers Devastation, Resident Evil PS4, Lords of the Fallen, Journey PS4, Until Dawn, GoT, TT Borderlands, Rocket League, Bro Force, Helldivers, Yakuza 5, ABZU? None of these excited u in the past 2 years? Seriously dude? I am sure Sony could come out tomorrow and give you Horizon, Uncharted 4, Lost Legacy etc for free on PS Plus – but you know what would happen? Geurrilla Games and Naughty Dog would go out of business and Sony not far behind. Then what games would you get with PS Plus? None. Perhaps it was a marketing error on Sony’s part, but PS Plus is simply not built for AAA titles. And it really never was. When we get one… that is great. But the most bang for your buck is when you get an Indie title that released that very month. Then they are giving you a bargain. I like how Jnooley posts a comment with positive excitement, and people find fault. I read the games listed below your comment and no, not exciting. The games are fine. I am glad for them. I am not excited for them. The odds of a game that excites me not already being in my library are slim. Resident Evil and Until Dawn were already in my library. I redeemed and have not once played every single other title listed. Drawn to Death and Killing Floor 2 got me excited and I have played both, but those were somehow overlooked in the list. Injustice Gods Among Us was another really good one. Either way this year is way better than previous years. I don’t expect much. The better the game, the more people already have it. Just Cause 3 and Assassin’s Creed spinoff are as good as it can get without too many people having the games already. Two years with no excitement is really not a surprise for a free games offering. This is a really good lineup! Before anyone says get PS4, because people are so predictable, I’ve had one since launch. It sits there gathering dust while I use my PS3 every day. Good PS4 lineup though, finally. That’s on you for being a cheapskate that buys almost nothing but 10 year old bargain bin games, according to your psn profile. Sorry but the PS4 Pro simply isn’t worth what it currently costs, hate to break it to you. That would be according to your opinion only SidNightwalker. As a 4KTV owner, enjoying the crisper IQ over 1080p has to be seen to even enjoy properly, its exceptional. There’s also games that look and run better than OG PS4. Take The Surge, runs only at 1080p30 on OG PS4 while PS4 Pro runs at 1080p60. Tomb Raider runs at 1080p30 Medium settings on OG PS4 while PS4 Pro runs 1080060 or 1080p30 High Settings. There’s many games like this too, Boost Mode on PS4 Pro also improves Framerates (The Last Guardian) and lock dynamic resolutions to their highest (DOOM). It’s ok to be not interested in the device due to costs (you can trade in off set that), or you don’t know/see a difference after checking out a Pro at a friend’s house, the opinion is yours without owning the device to confirm your thoughts. A broad paintbrush that it’s not worth getting the Pro is your opinion and yours alone. Every single months we got quality triple-A games on PS3 and tiny, albeit pretty good indie games on PS4. Finally the PS4 is getting the big games people have been crying and whining about and NOW you want better PS3 games? You want better games for a dead console? Come on, dude. I’m not saying go buy a PS4, the PS3 is still a fantastic console but you’ve had YEARS to get great games for free. Heh, yeah right. Overrated 4k, overrated VR, typical. Nah I have a gaming PC, I know what a truly high quality graphical experience is like, thanks. Damned ignorance of your average gamer, so easily impressed. SidNightwalker I never said a PS4 Pro is better than a PC, PC trumps all consoles in regards to performance, visuals, etc – just not sure why you went into off-topic territory in a PlayStation article but you do you. Anyway, I simply said your opinion is still your own as those that have the money to upgrade to a PS4 Pro see (and feel) the difference in a majority of the recent games. There is no need to get defensive over a plastic box you play on or offensive on one you don’t own. Options and what’s available to the consumer is bad now? It wasn’t off topic, I was simply replying to the general thread in one shot. Yeah it’s my opinion the PS4 Pro is lacking in proper backwards compatibility, in addition to lacking in exclusives when compared to it’s predecessor, therefore is not worth what it is currently priced at, whether you already have a PS4 or not. If ya don’t agree then hooray for you, you are one of the many gaming consumers that constantly pays way too much for a lackluster product. More power to you. The PS4 pro wasn’t made because of PSVR, it was made because there was a huge jump in NM chip design and new memory architectures that are dramatically affecting the pace at which faster chips at a lower cost can be produced, and it makes perfect sense to drop the base model down to $250 and then still have a high end $400 model that you can make money on and appease a certain portion of the community that doesn’t want to wait 3-5 more years for a PS5. No we do not need better PS3 games. A huge chunk of PS3 games have been given away. At this point we need to phase out or get rid of PS3 and PS vita games, in preparation for the PS5. There aren’t even any new PS3 games hardly coming out. Just Dance, PES, Fifa… THat’s your PS3 lineup. If you want access to a ton of great PS3 games cheap, and have good internet sub to PS Now. That’s your best option. Sony is going to be getting rid of PS3 games pretty soon I imagine. Maybe I’m underestimating the numbers, but they’ve given away 100s of amazing games. They gotta be running low. And that’s why the gaming industry becomes more and more anticonsumer every year. The brainwashed mentality you just gave a great example of. Nice work. What, what the hell are you trying to imply exactly? PS4 Pro is absolutely worth 399 and is soon to be 349.99. Are u kidding? If u have a 4K TV u are an absolute fool not to have a Pro. If u own PSVR u really should own a Pro. Even if u only have a 1080p TV the Pro is still a good investment due to Boost mode, downsampling, faster loads, higher resolution streaming, and more HDD space. It goes from 1.8 to 4.2 TF with double the HDD for $100 more. Also, his unwarranted mention of backwards compatibility shows me Sid is more likely a troll and/or an xboy. Have fun not playing Horizon, GT Sport, Lost Legacy, God of War, Spiderman, Days Gone, TLoU 2 ect at best quality..
Oh, no, I’m missing out on a mountain of mediocrity. Yeah, like you’d have the mental capacity to know what true value is, enjoying so much purely average dreck. Lol don’t bother with SidNightwalker guys. He’s an idiot. Just mad he can’t afford a 4K monitor and we enjoy better resolution. No PC gamer fails so hard to value improved performance and visuals. It’s not even his opinion. He is just salty. Otherwise he’d think PC rigs are criminally priced relative to the Pro. Once PC 4K/VR are in his mom’s price range he will stop crying on the internet about how overrated they are hahaha! Really solid line up. Just Cause 3 seems a lot of fun. Same for Downwell. Wish Freedom Cry had a plat. I know a lot of people had issues, but there never was one for me(I got it digitally, and played it on my regular PS4). I loved the game, and am glad people can play it. I had so many problems with this game. I still can’t play it. I got it digital when it first came out on my regular ps4 and it worked perfect. Amazing game! Loved it especially destroying bases with Jet’s and Heli’s. Yeah, I own it and my friend own it and we play on both owe systems pretty regular, never had any big issues, other then occasional frame drop and loading times. Definitely playable, love the wing suit. It’s LITERALLY playable to 100% and beyond on even a regular old PS4. I heard there were some problems when it first released but its been patched for years now. waddon1 – did you turn “Boost Mode” on? We won’t get Just Cause 3??????? Why GODDAMN IT! I would love to put a thumbs up on your comment. I feel discriminated, considering that I’m paying the same amount as americans for my PS+ account. GREAT Disrespect to some costomers. That does stink, but I am jealous of your PC gaming prices in LATAM. NUUVEM used to be my jam before they shut down out of market purchasing at Braz(s)il pricing. I know games are in certain countries (BRAZIL, INDONESIA, RUSSIA) are priced according to currency. If I wasn’t worried about violating Steam’s TOS I’d have 5k games due to the prices. I know that’s not the case with consoles, at least to the degree of PC pricing, and you end up paying way more on an equivalent currency basis so I understand your frustration. I just bought Strike Vector EX on sale and it’s fun, but it’s not JC3. It likely wasn’t a Sony decision but a publisher decision as Sony’s policy has traditionally been all PS4 games for Plus would be the same across markets but I noticed in some of the PSN stores in other countries (like the one’s I mentioned above and more) have way worse PS+ offerings which would make me reconsider buying the membership. You all should hit up the LATAM PS and JC3 twitter accounts and ask them to reconsider, I know it’s a long shot but it doesn’t hurt. Now that’s a lineup, the 99 cents movies are worth it! Thanks Sony! Well worth the wait on both of these games. Wow, people who haven’t purchased JC3 are so lucky!!! It’s an awesome game. I HIGHLY recommend buying the “Air” DLC which includes the jetpack. It will completely change the way you play the game!! Agreed, it’s called “Sky Fortress”. Definitely worth it. I’ll sure be re-playing this game, haven’t 100%’d on PS4 yet. Only issue is that JC3 is a real mess on both PS4 and Pro. Unless they release a perfomance patch people are going to suffer those mid 10 framerates. They actually did fix it. The framerate doesn’t choke nearly as much as it used to. The game almost never crashes anymore either! pretty true actually. I’ve beaten it twice kind of sorta, and barely have issues. What’s the reasoning behind the $.99 Movie Rentals not being available in Canada? Even if they were $1.99 because of the exchange rate it would still be worthwhile. Yet another great lineup on PS4. Thanks PS+ team. Love the boost in quality of games we have been getting over the past few months. Keep it up. As a PS+ and GwG user, with the exception of the X360, I do not take advantage of the free games. My issue with PS+ and XB1 GwG is that I do not own them. And yes I know technically I do not own any digital games. But with PS+ and GwG (except for the X360), you have to keep the service. Also, I have so much games that I have most of the free games. I have 244 PS4, 424 PS3, and 164 PSV games. I only keep PS+ and GwG for the deals and cloud saves. Either way, good PS4 selections and happy for those who hold out. You own digital games as much as you own physical games. You’re just borrowing a license to play it. @Blazing-Shadow14, I wish that was true! GWG you keep the games though. Sorry, but while the company thinks they are giving you a “License” the fact of the matter is when you buy a disc game, that print is yours to do with what you want so long as it does not violate the regions copy right laws. Meaning you can sell your copy to anyone and even dissect the contents of the disc for your own personal use. There is nothing stopping you. With a Digital license (which is why recent studies show their value is considered much less than a physical ownership) your license can be revoked at any time. You do not have an on hand copy you can re-install at your leisure. So no they are not the same thing. You can’t even trade your license with another platform user say an XB1 version for a PS4 version and vice versa. You do not get to keep anything other than the Xbox 360 titles. Everything else follows the same rules as PS+. You can discuss it with my deactivated Xbox Gold account and the games on my hard drive I can no longer use. This is not correct at all. A digital license and a physical license are owned, but the media itself, whether by download or on disc, is not. If this was the case, we’d have a MS-DOS situation. The law protects us from buying the software, and doing whatever we want with it. We are allowed the license to use said software, accessing it…We are not given the right to modify, edit, or copy said content for our own use. That’s entirely incorrect. This is also incorrect. The only limited license use is tied upon the platforms they are allowed access to, but beyond that…They are lifetime licenses. They do not expire, unless otherwise stated. So…This is incorrect. In the case of “PT”, there was no license, as it was never purchased. There are many games who’s publishing rights have expired, MvC2, Alan Wake Music Rights, or more recently THPS HD…But your license allows you access to them, within said platform. Nothing is revoked, unless the user goes against the Terms and Service with said SEN account or the GRANT OF LICENSE agreement itself. Bought JC3 last year and had to give up on it after a day because it was so unbelievably poorly optimized for PS4. Hope things have improved since. Worked well for me! Some people had problems some didn’t. Loved every minute of the game including the awesome dlc! Snakeball is from 2007. Come on. That being said, this is yet another great month for PS Plus users and I feel like you guys (and gals) get an earful every time they’re not the greatest of selections, it’s only fair that you get lots of praise when you deliver quality titles such as these! Wish I could take advantage of those 99¢ movie rentals, but I am stationed overseas. I’ve always wanted to play Just Cause. NO I can can play it for Free!! Now if PlayStation just hops on the reverse compatibility train, we are in business. They do it’s called PlayStation Now, a paid service. The bane of supporting the winner in the race, they don’t need to loose money to sell units. I don’t think PS Now is doing very well, so hopefully Sony will have no choice. Especially if MS whups them this holiday season. Incorrect again SidNightwalker, backward compatibility on the PS4 is more difficult because of the awful decision to use the Cell processor in the PS3. Even PC’s that trump the PS4 specs 5x over can barely run the PS3 Emulator, so if high end computers are struggling, what makes you think the PS4 can do it with the weak CPU in it? It can’t. The only reason Xbox One can run 360 title is because Microsoft was smart last gen to use a simple tri-core processor that can be emulated easily via a wrapper… Per title. Keep in mind the backwards compatibility is not every 360 title, it’s what publisher will allow an emulated wrapper for X1. Your last statement is puzzling as everyone knows sales are 2:1 right now, it’s going to be near impossible for Microsoft to catch up now. As odd as it may sound from my comment above, I actually want compitition to keep each other in check (one in particular who thinks too highly of themselves to deny features and services). I just have to be realistic here, especially since Sony is in more regions that are more accepting of the PlayStation brand than Microsoft [Xbox]. Dear GOD you live in a land of complete fantasy perpetuated by the lies of the internet. Even if you were correct, there is no excuse for not allowing people to play PS1 and PS2 Classics. None, zip. Not that your fanboyish mind really knows much about anything. SidNightwalker One does not have to be a fanboy to provide facts you know little of. My XBL and Steam ID is da1writer1985 btw, but I’m a fanboy (*Looks at PC as I type this*). Now, I never said backwards compatibility isn’t possible whatsoever, I said only PS3 titles (the tech inside the PS4 is too weak to even bother). I do agree with you that PS1 and PS titles should be possible as even mobile devices can run those games. I said due to there being little competition this gen though, I don’t expect Sony to do much though for their consumer base in regards to this (not saying this is a good thing either, simply stating the most likely reality). Again, I would prefer healthy competition but my thoughts this holiday season will be like every year, I don’t think anything Microsoft does will move the sales needle closer to Sony’s (I wish it did though as Sony has made some odd decisions like no cross-platform play, no EA Access, etc. All thanks to them being in the lead in regards to sales sadly). This comment section btw is meant for open discussion between gamers, let’s try to be informed and do some sort of research without spouting out nonsense due to what one thinks the other is and can only contest with insults. If you wanted a decent answer than you should have written a decent post before. I for one think the whole Xbox line could in fact and up outselling the PS4 come this holiday season 2:1 because of both the new hardware, new shiny hardware always sells, but not only that, the real kicker is the Xbox Pass, which utterly obliterates everything Sony has done in their PS4 strategies in every way. I have a good feeling that because of those two factors Microsoft could end up the major holiday champ, and whether that makes them above the PS4 in overall sales is irrelevant, because if Microsoft does indeed do exceptionally well during the biggest buying season, that will make Sony stand up and take notice, and hopefully change there ways a little bit. I’m not saying it’s going to happen, I just figure that there is a strong possibility of it happening, especially if Microsoft advertises the Xbox Pass like crazy. Cross-Platform with XB/Switch, you mean…They’ve had cross-platform games in several PC titles thus far this generation, most of which are from 3rd party publishers. Rocket League is one example in this regard, as well as FFXIV…That’s why it’s not on XB, cause they, at the time wouldn’t agree to it. I’m curious if Phil would be able to get that going, since his leadership is much more pro-consumer than Don’s. As far as B/C…It’d be nice if we get PS1/PSP titles available on the service, under an emulator, especially if they add something more significant than just trophies and “more” stable framerates (some games have significant framing issues). Obviously some games are always going to have problems, so they should be sifted/tested before going live, but it’d be nice to have our previously purchased digital titles available on the current generation platform. You’ve done good, Sony. Still saddening that you gave up giving high quality games on PS3. Another very impressive month. I was down on the PS4 IGC offerings for a long time, but they’ve been stellar these last few months. To anyone who says , just cause 3 won’t play on a PS4 , or that you have to have a PS4 pro to play it, Let me just tell you that is a load of crap. I have had the game since it came out. NEVER had a single issue with it, and no I don’t own a Pro. It is a very fun game that my son still plays almost daily. Freedom Cry?! ROCK!!! Freeing some slaves next month. Well if jedisok hasn’t had any issues with the game, I guess everyone else is just making it up. Thanks for clearing that up. On the ps3, Freedom Cry has a bundle with Liberation HD. Addendum to my comment: There is an Aveline DLC for Black Flag on ps3 & ps4 that’s an hour long. Just Cause 3: Makes the Month for me. Assassin’s Creed: Freedom Cry: Would have liked Black Flag instead and not some short adventure. Super Motherload: Will probably play this, wish it had a Vita version. Snakeball: No trophies, 9 year old game. Not touching. Downwell: Already own this, bought day one. Pretty hard but very enjoyable. Have not got the hang of it…hopefully one day get the platinum. Level 22: Will give it a shot since it is a Vita game. Decent month, JC 3 alone makes it a pass. That’s very informative. Thanks for letting us all know your preferences. Why is the deal for Doom PS Plus only? Don’t remember being announced like that on Bethesda’s blog and I think it was open on other platforms. I have the game already but have some friends, who aren’t PS Plus, looking forward to that. Wow solid month! JC3 is an amazing game and looks spectacular on the PS4, especially the Pro. I highly recommend it as it was a blast to go through and finish the campaign. AC Freedom Cry is one I have always wanted to get but never did. The .99 cent movies are a nice touch as well! Thanks Sony! Are the 0.99$ rentals available in Canada as well? Just Cause 3 is hands down one of my favorite games of this generation. Entirely worth it. Nice line up overall. HOLY CRAP JUST CAUSE 3!!!! Also, am I the only one who wishes the Vita owners would still get a retail game every now and then? Like maybe a Sword Art Online or Hyperdimension Neptunia occasionally? Or Trails of Cold Steel even. That you are not. Or at least some PSP games or PS One classics or just, anything but indies for the Vita. Go to the first year backlog, why not? I want Ninja Gaiden Sigma. Just Cause 3 and Assassins Creed are great! Gonna pick up Downwell which has been on my wish list for a while. Haven’t heard of the PS3 games. Whats really cool are the movies! Nice work! Disappointment, just like last month. Sony has finally decided to give out games good enough that I already own them, two months in a row. Good for the rest of you. I’ll add that I was very hesitant to buy Just Cause 3 because I’d heard about issues. I bought it digitally, on sale, and really enjoyed it. Load times are long and there are occasional frame rate drops, but the game is really fun. Nice, I’ve played JC3 already, but happy other people can enjoy the wacky game. Just don’t play the mission to much in a row… game has no variety in it’s mission structure.